Home / Sports / Local Sports / Morelli OnLion: What are the Odds? Morelli OnLion: What are the Odds? When it comes to Penn State football, the hot-button topic has been quarterback. A few weeks back, we made the case for Matt McGloin to be the starting QB. That generated a lot of e-mails to the Morelli OnLion inbox. With that in mind, we will explore the quarterback position some more this week and lay some odds as to who will be the starting QB. We’ll also have the scoop on Penn State’s latest verbal. Last season, we put odds on who would be the starting QB for the 2010 season. While we guessed wrong, it doesn’t scare us from putting odds on who will be the starter when the 2011 season begins on Sept. 3. With that in mind, let’s take a look at how the odds stack up in 2011. THE FAVORITE: Matt McGloin. For some reason, a lot of you don’t like Mac. We’re not quite sure why … the former walk-on singlehandedly rescued Penn State from a .500-or-worse season in 2010. Despite all of his heroics throughout the regular season, fans seem to remember his five-interception day against Florida in the Outback Bowl most. Despite a dreadful day at Raymond James Stadium, McGloin had the Nittany Lions in position to pull out the victory late in the contest. 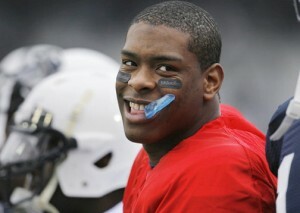 Despite the objection of Nittany Nation, we still like Mac as the starter when the 2011 season begins. THE UNDERDOG: Rob Bolden. Although Bolden had two horrific outings early in the year (24-3 losses at Alabama and Iowa), he was beginning to show signs of improvement before an injury sidelined him. But a terrible performance vs. Northwestern got him benched and he never re-gained his starting job. A tumultuous offseason began with Bolden trying to transfer before coach Joe Paterno denied the transfer request. Bolden often played like a true freshman, taking too many sacks and throwing too many balls into double coverage. Could freshman Paul Jones be the starting QB when the Nittany Lions' season begins on Sept. 3? THE DARKHORSE: Paul Jones. There’s a reason the Nittany Lion coaching staff redshirted Jones in 2010: He’s good. Jones looked very good in the 2010 Blue-White Game, but we haven’t heard much since. Jones came to Penn State a very confident young man and there’s no reason to think that any of that has changed. He may be the most talented of Penn State’s four QBs, but that’s no guarantee he will start. Jones will eventually start for the Nittany Lions, but it probably won’t be this season. THE LONGSHOT: Kevin Newsome. At one time, Kevin Newsome was the leading candidate to replace Daryll Clark as the Penn State starter. However, Newsome never matured and didn’t learn the playbook enough to grasp the reins as the starting QB. The few times we’ve seen Newsome in game action, he appears to have happy feet and often takes off out of the pocket, pressure or not. Newsome’s game is all run, no pass. We’re guessing that he will convert to either running back or tight end to earn some playing time this season. Penn State landed its 12th verbal commitment last week when J.P. Holtz gave a verbal to Penn State defensive coordinator Tom Bradley. The Shaler Area High School athlete primarily plays tight end, but has also played linebacker and defensive end for the Titans. Holtz stands 6-foot-4 and weighs in at 235 pounds. Pitt appeared to be the front-runner for Holtz, but a coaching change and some uncertainty as to where he would fit in with the Panthers swung momentum in Penn State’s favor. Bradley recruited Holtz as a tight end, although the Nittany Lions have a pair of other TE recruits – Jesse James and Brent Wilkerson. Holtz had 13 offers when he committed to the Lions. Among the other schools that had offered were Pitt, Michigan State, West Virginia, Boston College, Rutgers and Maryland. In the end, it came down to a couple of in-state choices – Pitt and Penn State. On Tuesday, the Lions landed their 13th commit, when New Hampton athlete Jake Kiley gave the Lions a verbal. He’s a 6-1, 175 pounds. He will likely play cornerback at Penn State. Morelli OnLion’s Final Thought: The Pittsburgh Pirates were on national television for the first time in a very long time on Monday night. In front of a national TV audience, the Bucs posted a 3-1 win. Not only was it great exposure for the baseball story of the year, it was nice to see ESPN to televise a team other than the Phillies, Red Sox or Yankees. The Buccos certainly were a refreshing change.